This isn't a module, it's a marathon. Far too long for the density of material presented. 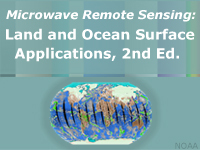 Should be divided into three or four separate modules focusing on the different microwave applications (perhaps sea ice and snow cover can be lumped together into one module). Nice lesson in remote sensing. IT IS A VERY GOOD LESSON TO IMPROVE OUR KNOWLEDGE IN THIS FIELD. I enjoyed this lesson it was full of valuable information. In fact, to absorb the info, I recommend taking the course over a two day period.